Rarely does a home of this calibre present itself in Napier South. Grand in size and stature, with stunning ornate detailing reminiscent of yesteryear but renovated with all the modern conveniences for a large and busy family. Upon entry you are met with a lofty ceiling height and polished floorboards which is repeated several times throughout the home. The central wide entrance hallway with rooms peeling to the left and right will provide you with a fulfilling feeling of being home. There are three living zones; the lounge / dining is positioned overlooking the front garden, with a wall removed it is ballroom-esque, at approximately 11 x 5 metres. A family room is open plan to a chic kitchen, which overlooks the pool and alfresco area, another excellent entertaining space for the summer months. Upstairs the third living area is an ideal retreat for children with French doors out to a private balcony overlooking the pool and enjoying views of Napier city to the Marine Parade. Five huge bedrooms (two up / three down) plus a study, family bathroom with freestanding bath and separate shower, the master bedroom enjoys a walk-in robe and en-suite plus there is the bonus of a third W/C in the separate laundry accessible directly from the pool area. A diesel boiler ensures the water radiators throughout the home provide comfort and warmth. A compliant woodburner has been installed in the lounge / dining room. A single garage and ample off street parking complete this extraordinary find. 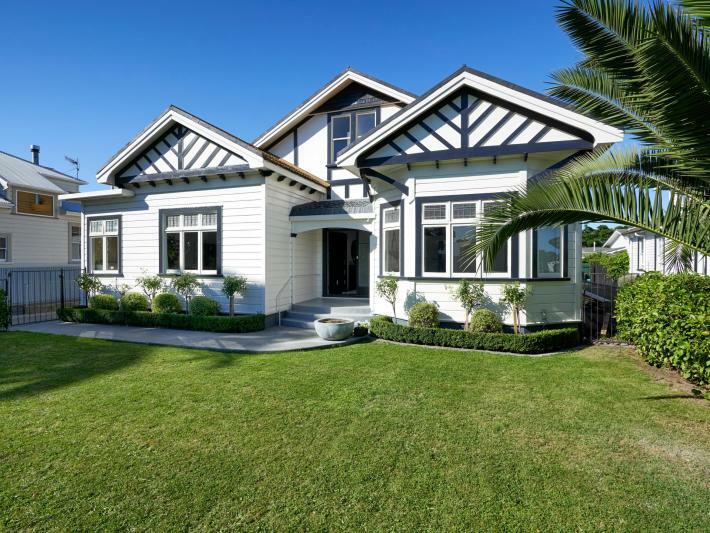 The value of this property is further underpinned by your proximity to Napier's CBD, a variety of schools, parks and amenities. Nelson Park on your doorstep, McLean Park just a few minutes' walk away. Zoned for NBHS, NGHS, Sacred Heart College and Nelson Park Primary, which is across the road. The vendors have lovingly cared for this villa for the past eight years.